Nobody likes having those unsightly veins spiderwebbing their way around legs. Most people opt for sweating through the heat by keeping their legs completely covered to avoid showing off the blue, red, or purple veins, but there is another option. Among newer aesthetic treatments, Asclera® hits a home run, as it removes small veins with fewer side effects than previous treatments. Asclera® (polidocanol) is a prescription medicine that is injected into the targeted vein in a procedure called sclerotherapy. And Why Is It A Better Choice? In the past, most dermatologists used hypertonic saline, which can burn and lead to scarring if not injected perfectly every time. Asclera® is the new “gold standard” for treating leg veins. It works by damaging the blood vessel lining, which causes the body to clear the vessel. How Effective is Sclerotherapy With Asclera®? 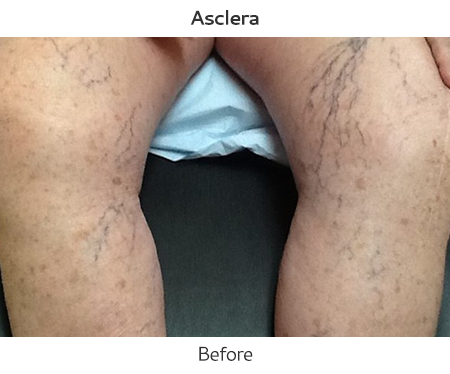 Asclera® is reliable, but as with all sclerotherapy, it can take several treatments for optimal results or complete clearance of veins. On average it takes 3-5 treatments, however it can take anywhere from 1-10 treatments depending on what is being treated. 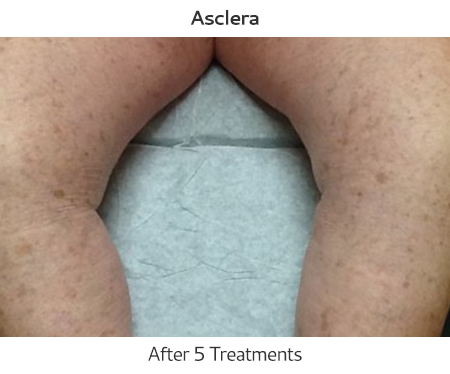 Clinical trials show that Asclera® had less irritation, less pain, less chance of hematomas (collection of blood under the skin), and less scarring than other sclerotherapy treatment options. While the treatments cause permanent changes, sometime the vessels re-open before the body has had a chance to remove them. Also, new vessels grow so re-treatments are often needed over time. A typical sclerotherapy session lasts 15 to 45 minutes. When we inject the vein, we can see the Asclera® clear it immediately, which is referred to as blanching. After we see this effect, we continue to inject any remaining veins that are apparent along that vein branch. While most offices use larger needles because they are less expensive, we use the smallest size needle possible for sclerotherapy (32 gauge) which is the same as used for Botox. When the vein is injected, patients will feel a small pinch with the sclerotherapy needle and mild burn when injecting larger vessels (we treat 1-3mm vessels, not the larger varicose veins). The pain only lasts a few seconds during the treatment and does not hurt after. At the time of treatment, patients will see little pink bumps that look like hives, which indicate that the desired vessel damage has occurred. 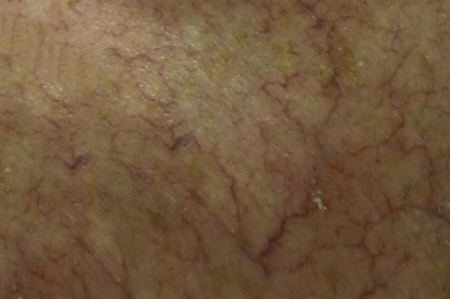 These bumps usually resolve by the next day, though it normally takes the body 4-6 weeks to clear the blood vessel. No preparation is needed before treatment. Following treatment, compression stockings or support hose should be worn continuously for 2-3 days and then for 2-3 weeks during the daytime only. For 2-3 days following the treatment, patients also need to avoid heavy exercise, sunbathing, long flights, hot baths or saunas. The reason for this is because the blood vessels have been closed down with the treatment and too much pressure from heavy exercise could open them back up. The stockings keep the pressure on the veins to keep them closed. In addition, hot environments cause blood vessels to open to release the heat, but in order for treatment to be effective these vessels need to stay closed. 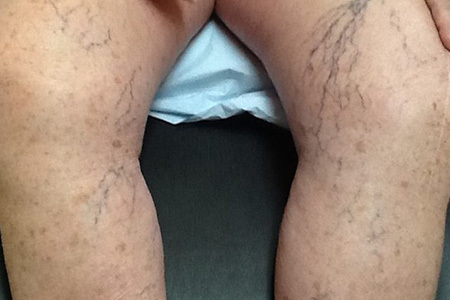 Which Veins Can Sclerotherapy Treat? This procedure can treat two types of veins – spider veins and reticular veins. Spider and reticular veins can be caused by many factors such as heredity, age, gender, pregnancy, obesity, and prolonged sitting or standing. It is interesting to note that women are 2-3 times more likely to develop them than men. These are very small, fine red or purple veins, which are close to the surface of the skin and resemble tree branches or spider webs. These veins are also known as feeder veins. Reticular veins are the blue and green veins beneath the surface of the skin. At Siperstein Dermatology Group we offer laser treatment with a 1064nm ND:YAG laser, IPL treatment, as well as sclerotherapy with Asclera®. Preparation for receiving laser treatment and IPL requires you to stay out of the sun for a little while. Patients undergoing laser can expect to feel a mild heat and will be required to wear the provided goggles to protect their eyes from the bright light while undergoing treatment. When To Choose Laser And When To Choose Sclerotherapy? The answer to this is often both. Sometimes the blood vessels are too small for our needle to fit into. In this situation we would need laser. Often, treatment starts with sclerotherapy to get the main vessels and then clean up the remaining redness and smaller veins with the laser. Since it is not FDA approved to use Asclera® on the face, we most often use laser. If someone is tanned, we cannot use the IPL and need to either use sclerotherapy or the ND:YAG laser. If you have any further questions about Sclerotherapy and vein removal procedures, contact a professional at Siperstein Dermatology Group or schedule a complimentary consult by calling our Boynton Beach or Boca Raton office today.